SIMAR is an acronym for Société Industrielle de Machines Agicoles Rotatives. 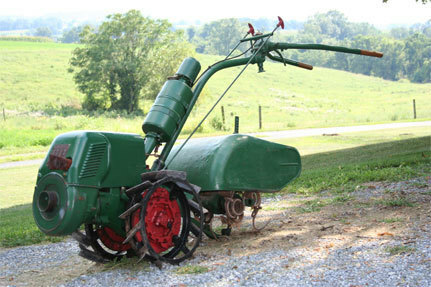 These tillers were made in Geneva, Switzerland, and imported by ROTOTILLER, INC. from 1932 until 1939. After WW II, E. C. Geiger Co. of North Wales, PA became the sole distributor in the US. SIMAR exported their tillers to the US until 1975. They manufactured tillers from 1918 until they stopped production in 1982. SIMAR manufactured several size machines. They ranged from 2½ to 10 horsepower, a tilling width of 14" to 36", and weighed from 220 to 880 pounds. 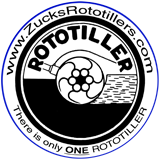 ROTOTILLER, INC. purchased the rights to use their engine and tine configuration for tillers they manufactured. According to information posted on a French SIMAR site, there were 700 of these tillers made from October 28, 1933 to April 6, 1936 with serial numbers 13001 to 13700. So, this particular tiller may have been built in 1933 with an early s/n of 13049. It has a two-speed transmission, which is selected by inserting a long plug or pin in either the right hub for hight speed or the left hub for low speed. It has separate controls for the tiller and wheel drive. It has ratchet hubs to aid in turning. The C-30 is a 3hp machine with a 14" tilling width. The handlebars can be moved up, down, left, and right to accommodate the operator's comfort. For additional information on SIMAR check out Donald's Antique Rototillers, Bungartz, and the French SIMAR site. The French site has a link on it to translate the site. In addition, Donald Jones' book The Rototiller in America is a great resource for SIMAR tillers. Hear and see this tiller in action here.